The demise of my Thuja's. I planted a row of Thuja Occidentalis Smaragd about 6 years ago. They grew well and looked good until a few months ago. In the Autumn of 2011, 2 were dead and I removed them, now the rest are going fast. We had a period of drought last year from July till December. They are in a shady spot close to a large Robinia tree and a weeping willow. Can anyone tell me whether it was the dry conditions or whether there could be another reason. We felt they were well established so did not give them much water last year, everything else needed the water. The photo makes it look better than it really is by the way. It's a bit browner in reality. Having checked your profile page, I note you mention your soil is sandy. Thujas will be killed by drought even when they are mature - they prefer a slightly acid, moist soil. I'd guess that, on sandy soil, and without being given water during a dry period, the cause is insufficient water. Thanks Bamboo, that's my thought too. Other Thuja hedging in the garden looks healthy, but I think the big Robinia tree made it worse by drying out the soil even more. Do you have any suggestions for drought resistant and hardy evergreens that might cope better? Juniperus varieties spring to mind - they actually prefer a drier soil, preferably with a bit of shale, that's their natural choice. 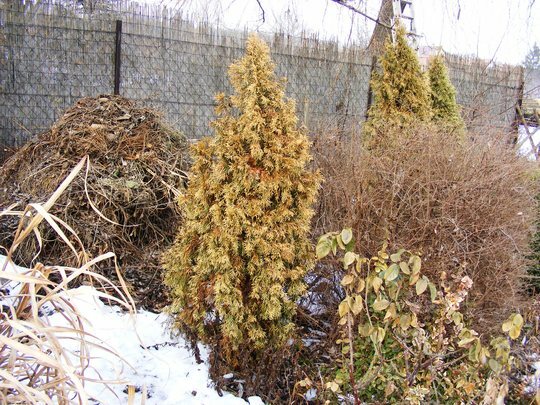 I googled 'conifers suitable for dry conditions' first - on the list I found on one site, it mentioned Thuja - just goes to show ,you can't believe everything that's on the internet. I looked up my encyclopaedias here instead for more accurate info. By evergreen, do you include in that non coniferous evergreens? What size did you want them to be? Don't mind whether conifer or other. We would need to be able to trim to keep around 2-3m. Something that will hide our rubbish behind this spot, and provide backdrop for smaller shrubs/flower bed. It's interesting that we live in a sandy area with very hot summers, and a lot of Thuja's are grown. I'm not sure whether this is the influence of garden centres shipping them in from further west, though I would think most are locally grown. I also observed a number of neighbours with sick looking conifers, but not necessarily Thujas. Berberis darwinii might fit the bill then - or Euonymus pictata. Hi Bamboo, I've been searching for pics and info about Euonymus pictata but can't find it. How tall does it grow? I have many other Euonymus but they are all smallish, and I think they are E Fortuneii, or alatus. Any more info? The other point is whether anyone sells it here in Hungary, but that is my problem!